Donuts for “Dunkin’” | Can't Believe It's Allergy Free! 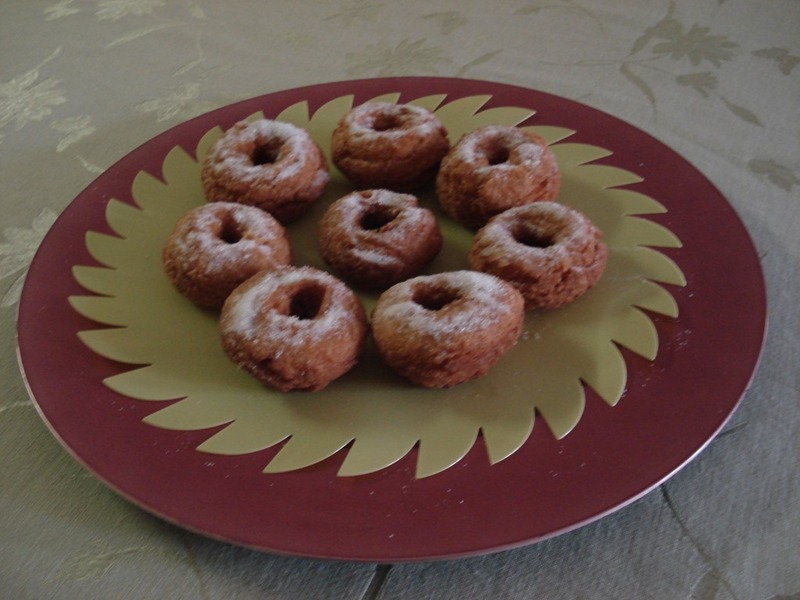 Yes, you can actually make donuts with my gluten free flour (See Basics or scroll to the first entry on this blog) You cannot imagine how easy it is to make kids happy that they can carry donuts to school for snack time as very special treats. Donuts are fried which does not make them very healthy, but they are great as occasion food. Moreover, my gluten free flour is very nutritious—much better to have than processed white flour. So get ready to make this easy treat! * If you do not have Egg Replacer, use buttermilk instead of milk and add 1/2 teaspoon baking soda, Add soda while combining dry ingredients. You will also need a 2” round cookie cutter or a clean lid, and a smaller lid about 3/4” in diameter, a sheet of parchment or plastic foil to line your cutting board. The number of donuts you will have depends on the size of your cookie cutter/lid. In a medium mixing bowl, combine flour, baking powder, cinnamon and nutmeg powders and salt. In a large bowl, whisk together melted butter, milk / buttermilk, sugar and vanilla. Gradually fold in dry ingredients. Using a food processor, or your hands, knead this mixture to form a soft dough, which can be manipulated with your hands. Gently roll each ball and flatten with your palm on a parchment or plastic foil lined cutting board. This will prevent the donut rounds from sticking to the surface. Flatten or roll out sufficiently to press the cookie cutter on it to get a good round shape. Remove excess dough. Then press the small lid onto the center of the ball and gently remove the small round which you cut off from the center. Keep all the small rounds together to form into additional larger balls. Use extra small balls to fry as donut ‘ holes’. Or fry all small balls to make donut holes. Heat oil in a medium size wok. Oil should be sufficient for donuts to submerge. Test oil for doneness by adding a small ball of dough. It should sizzle slightly and slowly rise to the surface. After donuts rise to the surface and start to brown a little on the underside, gently flip them over with a fork. When donuts are a rich golden brown color on both sides, remove each donut carefully with metal tongs or with a slotted spoon, and place on a paper towel lined plate. After the oil has drained, roll each donut in granulated sugar and enjoy! Donuts can be cooled and frozen. I wrap each donut in wax paper and place the quantity to be frozen in an airtight container. When ready to eat, thaw in the microwave before serving. Saw your blog and really liked it. I have a question – When replacing oats in Grandmas gluten free flour mix with cornstarch I have a confusion. We are already adding 1/2 cup of cornstarch with this replacement does it became 1.5 cups of cornstarch in total or just 1 cup of cornstarch in the mix? Am I correct in my understanding? Please clarify?